Fed 4 (ФЭД 4) – John's Cameras. 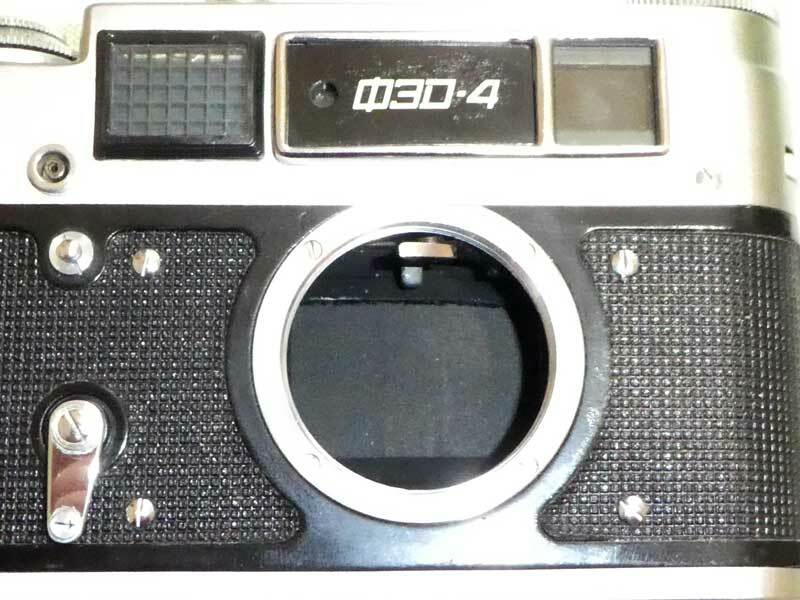 This Soviet Feed 4 is a camera with an impressive pedigree. The original design was by Oskar Barnack and the Leica 1 introduced in 1926 by E.Leitz (Leica = LEItz CAmera). An orphanage in Karkiv, Ukraine set up a workshop to produce copies of the Leica II as a training exercise for teenage boys. This copy was sold as the Fed (named after the head of the NKVD). In time, this changed from a training exercise to full-bloodied commercial production. During WWII, the factory was destroyed and after the war ended, production was temporarily moved to the Krasnogorskiy Mechanicheskiy Zavod factory outside Moscow. 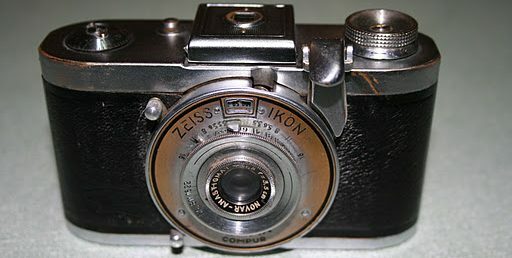 When the Fed factory was rebuilt, production was moved back but the Krasnogorskiy Mechanicheskiy Zavod factory also continued production with cameras now called Zorki. I already have in my collection, Fed 2, Fed 5 and Zorki 4. The Fed 2 and Zorki 4 only differ in details, the main one being the extended rangefinder base of the Fed 2. The Fed 4 is a further refinement which embodies an uncoupled light meter. The overall shape of the camera is a rectangular ‘brick’ with rounded ends. The ‘brickiness’ is broken up by the film advance being in a lowered section of the top plate. The film advance is a lever. This is slightly curved and is quite comfortable to use. The travel of the lever is just over 180 degrees and easy to do in one motion. The lever is on a ratchet and it is possible to advance the film with several shorter motions. The central boss of the film advance has the frame counter. This needs to be set to zero manually and counts up. If you are lazy like me, you can ignore this completely and continue to use the camera until you cannot advance the film anymore. The counter counts up to 39. Right in the centre of the frame counter is a reminder for film type. There are three settings: sun, light bulb and circle. With colour film, each brand would come in two versions, one colour balanced for sunlight and one colour balanced for artificial light. The circle position is intended to represent black and white film. This is merely a reminder has has no effect on the operation of the camera. Nestling in the corner of the film advance is the shutter release. This is chrome plated steel and is threaded for a standard cable release. Around the shutter release button is a milled collar. This has two positions marked B and C (in Cyrillic – V and S in the Latin alphabet). This is depressed and turned to allow rewinding of the film. This is very fiddly to get at and turn. 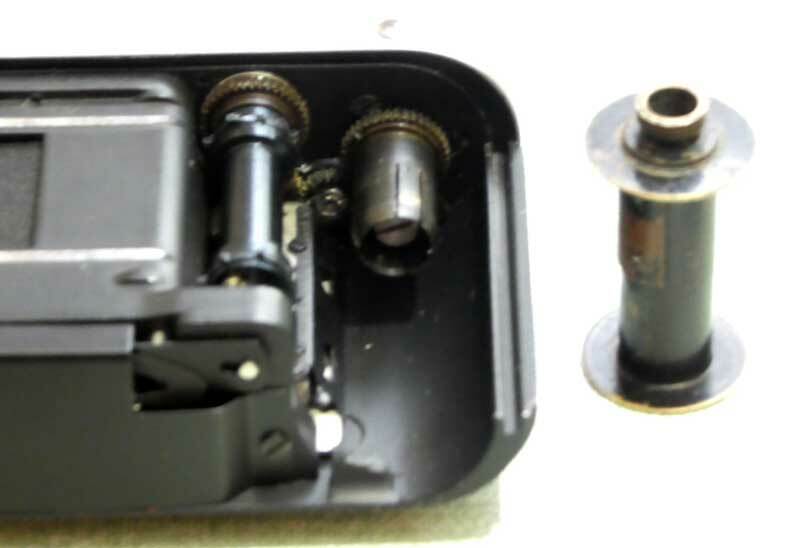 Next to the shutter release, on the raised portion of the top plate, is the shutter speed selector. This is used by lifting and turning to the required speed – indicated by a red arrow. In common with the other Leica derived cameras (Zorki, Zenith and other Fed models) it is important to do this only after advancing the film. Speeds available are the standard range from 1 second to 1/500 seconds. Next along is the accessory shoe. No electrical contacts here so a cold shoe. On the left hand end of the top plate are the light meter controls. 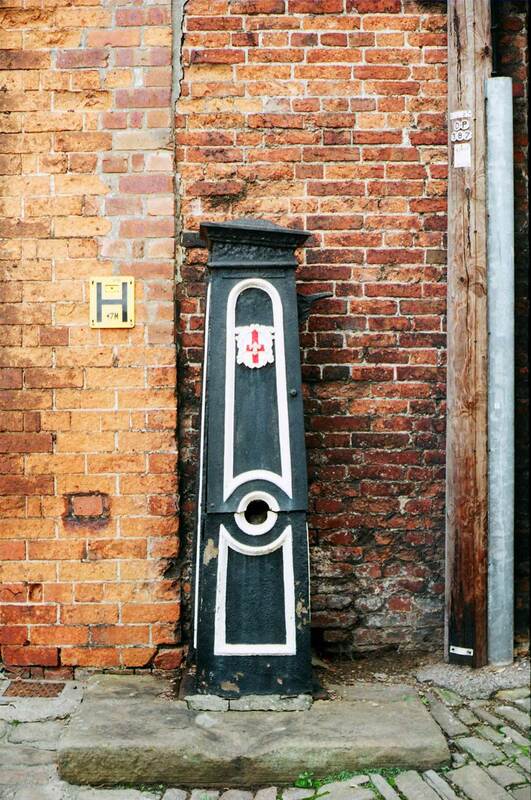 This is a selenium meter and so does no require a battery. Looking at Interweb articles, you could gain the impression that selenium meters eventually deteriorate and lose their sensitivity and so should be avoided. 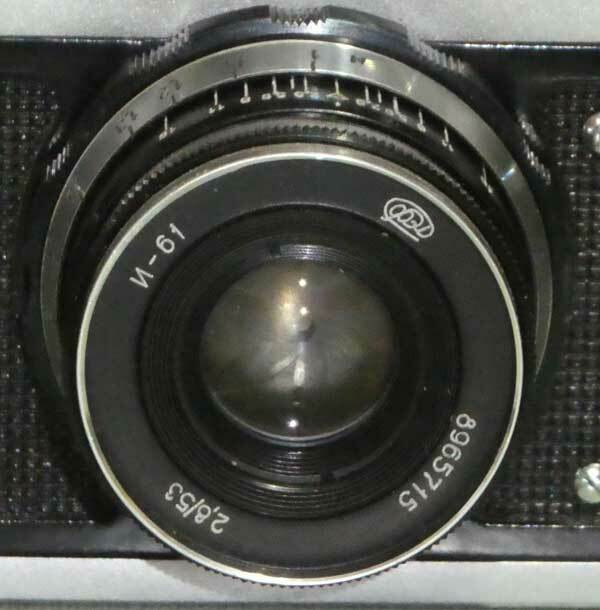 I have selenium meters that are over 55 years years old and still agree with my modern digital camera. This is a match-needle type meter – you turn the outer ring on the controls until the red needle is over the white needle. At this point, you can read the correct exposure from the black scales. Before this, of course, you need to tell the meter the speed of your film. This is in ASA but the range offered is rather strange: 20, 40, 80, 160, 320. The reason for this (my guess here!) is that it is translated from the German DIN scale, being centred on DIN 20 (=ASA 80). Assuming this makes setting the camera easier: ASA 100 = DIN 21 = one division past ASA 80. ASA 200 = DIN 24 = four divisions past ASA 80 or ASA 160 plus one division. The front of the camera is in two parts. At the top is a deep, chrome top plate. This contains a square viewfinder window, a small, round rangefinder window hiding by the ФЭД-4 logo and a square light meter window. By the corner of the light meter window is a PC (Prontor Compur – named after the two German shutter makers, both owned by the Carl Zeiss Foundation) connector for flash. This will be X synch for electronic flash at this date. At the left hand end of the top plate is a milled wheel protruding from the side of the top plate. This is for rewinding the film. 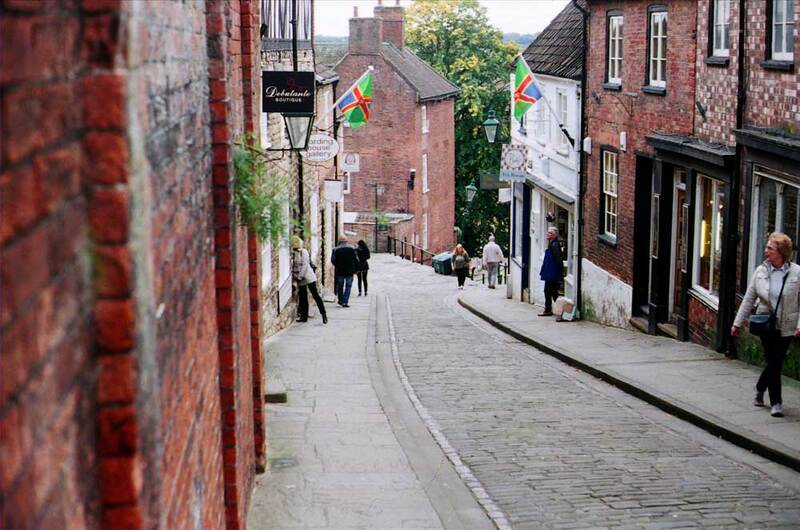 It also acts as a visual check that the film is advancing correctly. On the back of the top plate is a small round viewfinder eyepiece which has a milled surround – guaranteed to scratch modern plastic spectacle lenses. This milled surround can be rotated to adjust the eyepiece for spectacle wearers so there is no need to wear glasses when using this camera which obviates scratching the lenses. 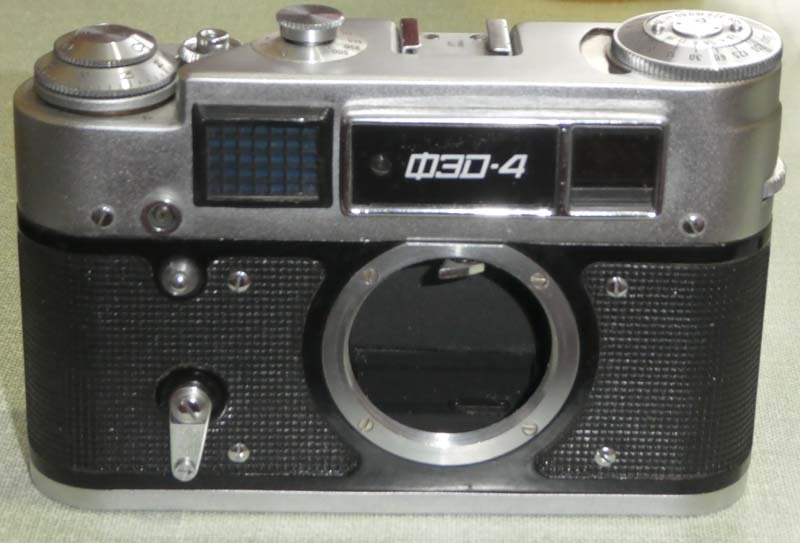 There is also an embossed ФЭД logo and the legend “MADE IN USSR” indicating that this camera was made for export. Beneath the deep top plate, the camera is covered with a black plastic ‘leatherette’. 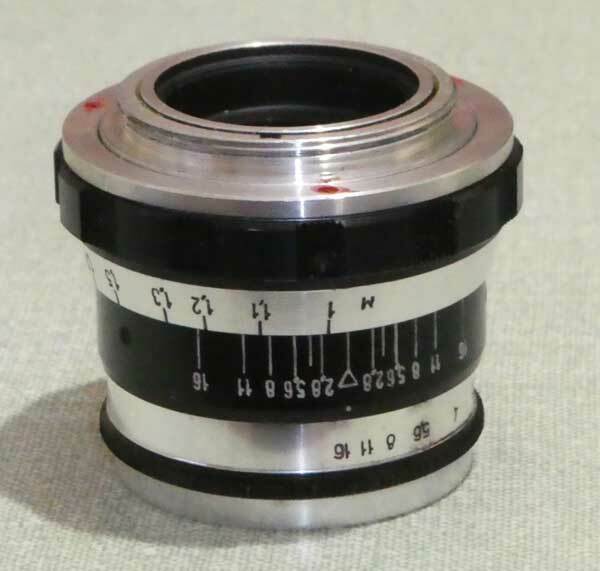 On the front, below the ФЭД-4 logo, is the lens mount. As this camera derives from the Leica II, the lens mount is LTM or M39 (Leica Thread Mount which is 39 mm diameter and 1 mm pitch). Just inside the lens mount, at the top, can be seen the focusing cam. As the lens is focused towards infinity, the lens pushes this cam inwards which in turn moves the rangefinder image. Around the lens mount are four chrome screws which I assume hold the internal shutter crate in place. To the right of the lens mount (left, when looking at the camera rather than using it) is the self delay lever. This rotates through 180 degrees to wind up the mechanism – it is activated by pressing a small chrome button just below the top plate. Lens mount with focus cam at top. The base of the camera has a tripod boss just below the lens (1/4 inch UNC), next to which is the serial number. On many Soviet cameras, the first two digits of the serial number are the production year but not here. The number is 097010 – I do not yet know which year this is. On either end of the base plate are a folding cam. These are lifted and turned half a turn to release the base and back in one piece to allow access to the inside of the camera. Inside the camera, the film cassette fits on the left. On the right is a removable take-up spool. These frequently get lost, unfortunately, and when buying a Soviet camera it is worth confirming that the take-up spool is included. 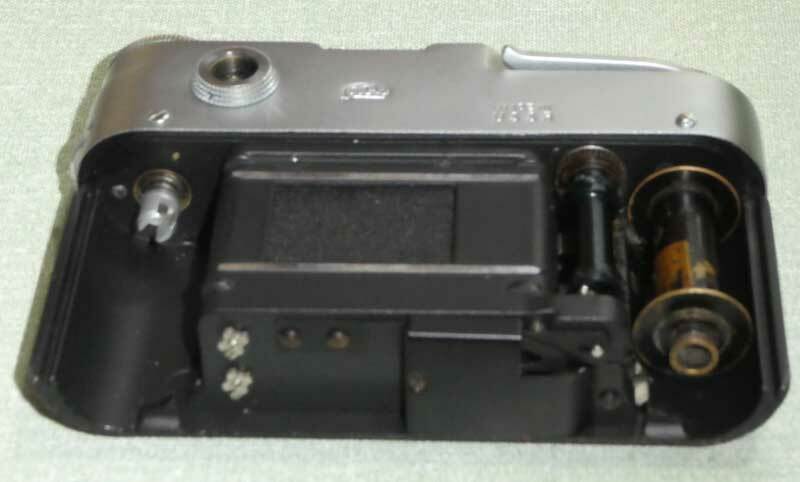 The idea behind the removable spool is that it can be replaced with an empty Leica cassette (not the modern Kodak cassette) removing the need to rewind the film. The take-up spool rotates ‘backwards’ and winds the film emulsion side outwards. The lens supplied with the my camera is the Industar-61 which is a Carl Zeiss Tessar design. The lens has a focal length of 53 mm and an aperture range from f/2.8 to f/16 with click stops (it would seem that many Industar-61 lenses go to f/22 but not this one). There were a number of optical factories making lenses in the Soviet Union with differing reputations. This lens was made in the Fed factory in 1989 – whether that is a good thing or not, I don’t know but the lens certainly performs well enough. The negatives are exposed well showing the light meter is OK. There are no light leaks and the shutter curtains are moving smoothly enough to give an even exposure. 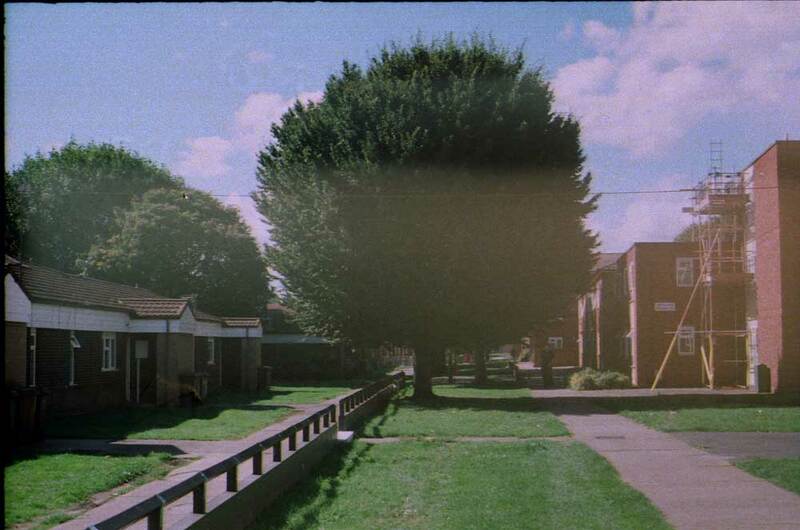 The only camera fault is the level of flare in one (just one) frame – see below. 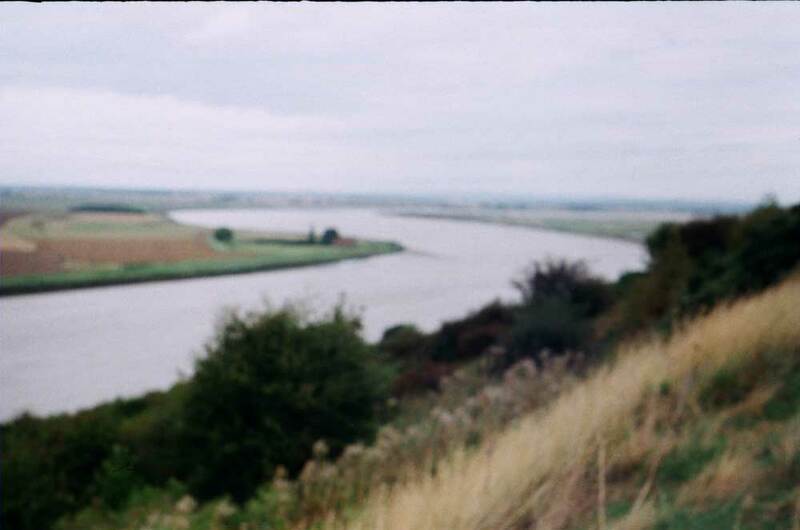 I had a fault in that the viewfinder is always in focus and a couple of times I forgot to focus the camera. If I was using this camera all the time, that would become second nature. 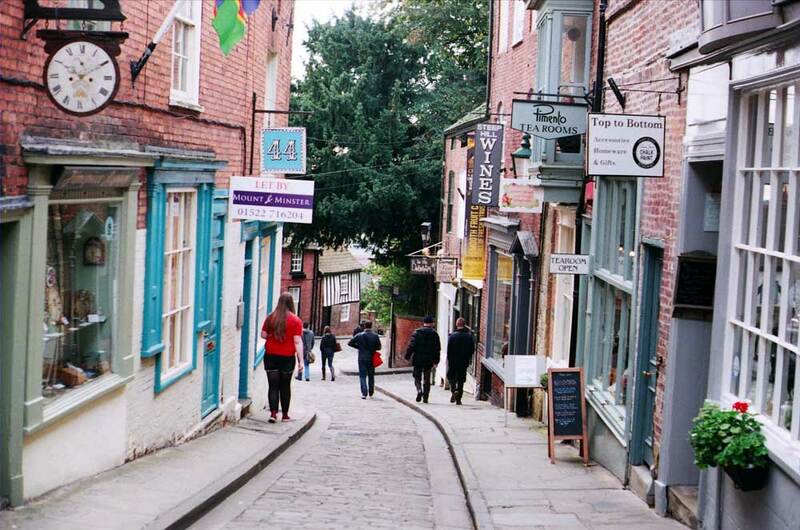 I am pleased to report that I did not fire off half a dozen shots with the lens cap on – which I did with my Fed-2. I did a rangefinder test by focusing on a steel fence. I focused on the first ‘silver’ finial which should have been in sharp focus but it is barely in focus at all. See below. 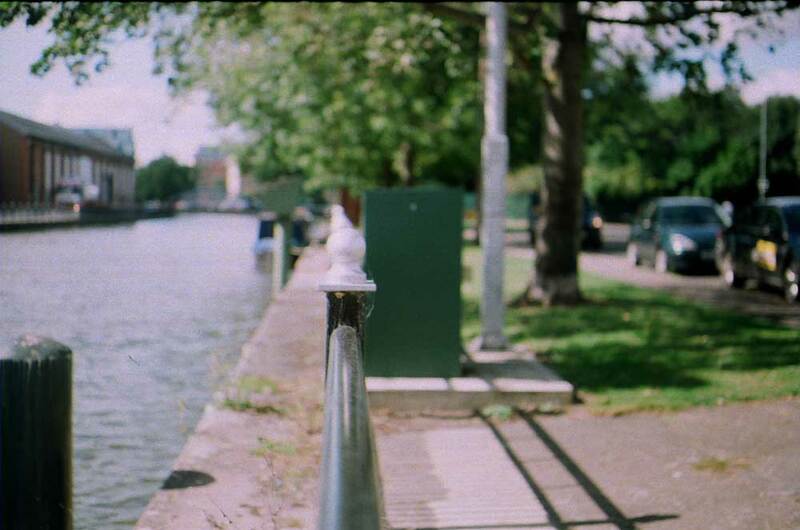 Rangefinder test – the first finial should be in focus. 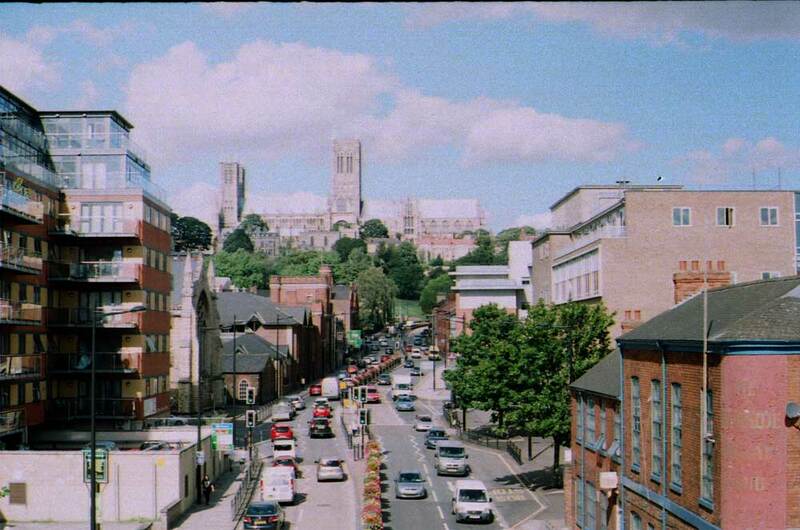 Broadgate, Lincoln and the cathedral. 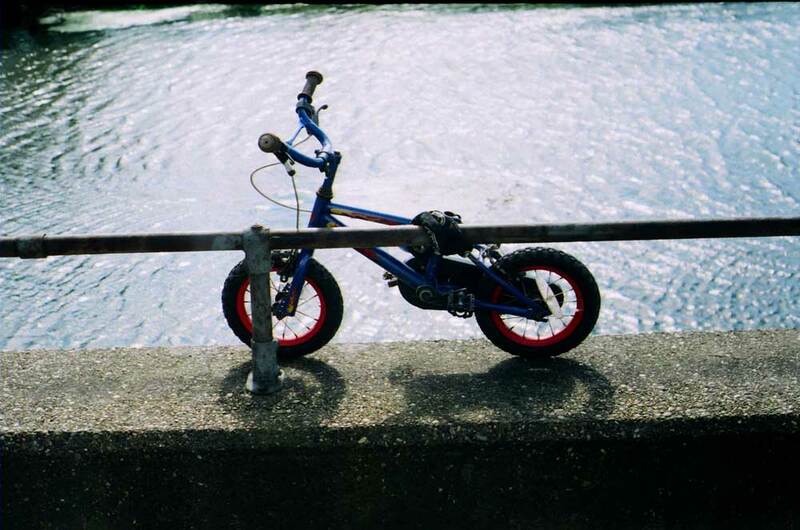 My usual photo of the abandoned bicycle. Thoroughly enjoyable site, an excellent read. I bought a couple of FED 4’s off Ebay yesterday, keen to see if they work ok, less keen to repair them if they don’t. Broadgate seems to have changed somewhat from 1956 when I last visited! Pleased you like my blog. 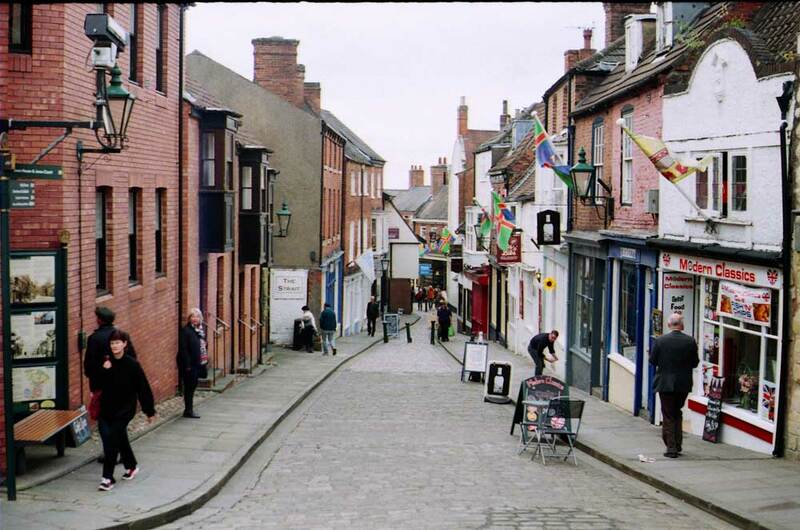 Yes, Broadgate has changed – even in the 15 years I have lived in Lincoln.